Looking for Inspiration and Ideas for Your Book Club? Jane Haase, founder of the "Bookaholics" of Kentucky, shares a wealth of ideas on how to keep a book club fresh month after month. BookBrowse interviews Looking for Inspiration and Ideas for Your Book Club? Jane Haase, founder of the "Bookaholics" of Kentucky, shares a wealth of ideas on how to keep a book club fresh month after month. 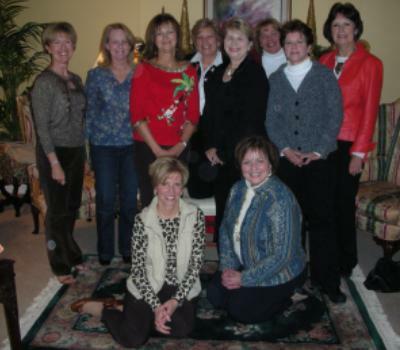 about all aspects of their book club.
. Hello Jane, thanks for chatting with us today about your book club. Does your group have a name? We're the "Bookaholics". We tossed around several ideas at our first meeting but several of my friends have given me that designation and when I suggested that name, everyone seemed to think it was appropriate. What makes your group special (and which one are you in the picture)? I'm the one in the front kneeling down on the right; I guess the most special part is that because we have a pretty large group (29) we always have a different mix of personalities when we meet. We average about 8-10 people at each discussion and they're not always the same 8-10 people. It's fun to see how the different mix of people each time sways the group dynamic. Keeps things interesting! My daughter moved to NYC after college and immediately got involved in a book club there. I kept up with their readings and always enjoyed talking with her about how they reviewed the books they were reading, so one day I just decided to start my own group. I sent out invitations to various people I KNEW were avid readers , explaining my idea for starting a club, set a date for an initial meeting, and asked each of them to bring a couple of their friends they thought might be interested. I believe we had 13 at our first meeting in November, 2003. Tell us a bit about your group? We currently have 29 women who receive Evites for our monthly meetings. (www.evite.com is a free online invitation service that we use to announce our book and meeting place each month). There was never a conscious intent to exclude men -- in fact, we have invited several men to join but so far have had no takers. I actually think they would generate a new viewpoint and slant to our discussions -- we'll keep trying to recruit some. How would you describe the personality of your group? That's a tough one ... we just all enjoy each other and our different viewpoints. Many times our book discussions veer off into how this somehow relates to some crisis one of our members' is experiencing -- we learn from our books and then from each other how to approach life's many challenges in the real world. What's your favorite thing about your book club? Well, being the Bookaholic that I am, there's nothing I enjoy more than sharing the discovery of a really good book with friends and seeing their reaction to it. Good or bad .... I just love to explore the different reactions to the same material. The first meeting I selected the book for the subsequent meeting. We then decided to rotate the selection of the book each month. Each member volunteered to host the meeting at their home one month and that month she got to select the book. That didn't last very long. Most of our members don't really enjoy scouring book reviews, websites and bookstores to find interesting books -- they would prefer to have a book recommended by a friend and KNOW that it would be interesting before investing their time. Now me? I read ANYTHING. Maybe once or twice I have not finished a book -- I read them through to the end, because I don't care what the subject is, I find them interesting. Maybe because I am a frustrated writer myself -- I just enjoy seeing how different writers express themselves and develop a story. The group decided because of this unnatural obsession, they wanted me to select the books each month. So, how do you decide on the books? We try to have at least one book each year in historical fiction, biography, bestsellers, mystery, history, business, classics, Pulitizer Prize winners, and yes, even "Chick Lit". Are there any books that stand out as favorites? Snow Flower and The Secret Fan by Lisa See, The Rich Part of Life by Jim Kokoris, and The Da Vinci Code by Dan Brown were probably the books most universally liked by our group -- we did not enjoy Look At Me by Jennifer Egan and surprisingly enough, The Plot Against America by Philip Roth. 102 Minutes: The Untold Story of the Fight to Survive Inside the Twin Towers by Jim Dwyer and Kevin Flynn was also a favorite but the month we read it was in the summer and the discussion was poorly attended. Those who did really enjoyed learning more about the background of 9/11. Have there been any books that bombed? I let my personal love for Christopher Moore's wacky writing influence me in the selection of The Stupidest Angel for our last Christmas meeting -- mistake! No one else in my group seemed to appreciate his brand of humor like I do! Sea Glass by Anita Shreve was also a little disappointing, but I think that is because we read it the month after we read The Da Vinci Code when we had a VERY lively discussion of religion and values. Over the years I have noticed that usually our best discussions are books selected during the winter months when everyone is focused on reading. One summer we disbanded until fall because many of our members felt they would not have time during the summer months to get together for discussions, despite the fact they might read even more during those months. They admitted their taste for "deeper" fare lessened in the summer. Now we are meeting again in the summer but I try and pick lighter novels and get in our "chick lit" selection for sure during those months. I would say our most interesting discussions were the months we discussed Nickel and Dimed by Barbara Ehrenreich, My Sister's Keeper by Jodi Piccoult, Snow Flower and The Secret Fan by Lisa See, The Power of One by Bryce Courtney, and Slammerkin by Emma Donaghue. Why do you think some books have made for better discussions than others? With the current makeup of our group I would say the best discussions are usually when we have a really good "story". I think we sometimes have as good a discussion about "bad" books as we do the really good ones. I usually try and gather questions from various sources so that we have a starting point for the discussion and then we branch out from there. I'm a member of BookBrowse and I also use www.readinggroupguides.com as a resource. Once a month, 7 p.m. at night -- Usually the third Tuesday of each month but that is sometimes adjusted due to holidays or other general conflicts. Can you tell us about a typical meeting? We mix it up to keep things interesting. If someone volunteers their home, we meet there. We also have been known to meet at coffeehouses and bookstores. If there is a movie made from the book, on occasion we have rented the movie, watched it at our meeting, and then discussed both the book and the movie and the strengths of each in getting across the story. We have met at a movie theatre, watched the movie, then discussed the movie over dinner in a restaurant. This fall we read Widow of The South by Robert Hicks. We live about two hours from Franklin, TN where the story takes place so we traveled there on a Saturday and took a guided tour of Carnahan (the plantation in the book) We all agreed the onsite tour added immensely to our enjoyment of the book, which otherwise might not have been a favorite. Since I pick the books, I am usually by default the leader. We get settled with refreshments, wine, tea, coffee, whatever the venue offers. We start out by introducing any guests and then I usually ask -- what did everyone think about this month's selection? I think it's good to get that out front first. Let everyone expound on whether they liked or disliked the book as a whole....then actually begin with discussion questions that focus more on the story, the writing and what the author meant to convey with each. I try and provide "extras" when I can about the topic. For instance, with Snow Flower and The Secret Fan I checked out several coffee table type books on footbinding I found in the public library. That always helps us get a broader understanding of the subject matter. After we finish with the book discussion, we go around the room and share thoughts about other good books we have read since our last meeting. (Most members bring notebooks to keep tabs on these for their next visit to the bookstore) This sometimes expands later into a discussion about good movies currently playing. Finally, we finalize our next meeting date, time and meeting location and I announce what the next book selection will be. (I follow that up with that information in an Evite (www.evite.com) as a reminder for those who were at the meeting, but also to inform the rest of the members of the club so they can get started on the book if they plan to attend the next month. Do you have any special events or activities? Each year at Christmas we have our meeting at a member's home. We each bring an appetizer (with several copies of the recipe for sharing) and a new paperback book. This book can be one that is a particular favorite of yours or can be one you've been intending to read. We usually have a light book selection that month and the discussion is generally short. We tried once to connect with an author for a meeting conference call, but our signals crossed somehow and we never received the expected call. I have corresponded by email with several of our authors and have always found them to be very forthcoming in answering any questions I have to help me prepare for our club's book discussions. Both Jim Kokoris and Christopher Moore were very helpful and seemed genuinely flattered their books had been selected. I have continued to email Jim Kokoris occasionally to keep up with when the movie from his book The Rich Part of Life will be produced ... it has been optioned but is not yet on the studio work schedule. If you could start again is there anything you'd do differently? I think we maybe should have addressed the question up front about loving/hating a selection.... the first year we got a little bogged down at times with members focusing on whether or not they "liked" the book. That's why since then we have addressed that question right up front THEN gone on to a good discussion about the meat of the book. I truly believe you can not "like" a book but you can appreciate the author's style of writing or certain aspects of the book. The more authors we read, the more we are able to compare styles of writing and options for storytelling. I think that some of our members who really had not read enough to know whether they liked certain styles of writing or certain authors are now a little more savvy to these ways of picking out books they will "like". We had a fairly in depth discussion one meeting on how simple things like the paper weight of each page and various typestyles can influence your selection of reading material. Some people found they prefer hardbacks, some trade paperbacks .... some like thin, parchment-like pages, others prefer thicker stock .... some love sagas of 500 pages of more .... some won't even start a book if it has more than 300 pages. Cover designs influence more people than you would think -- and one person steers away from books written by women. ????? I'm sure publishers know and play on all these preferences but it made for a very interesting discussion. Do you have any tips for other book clubs? I found my club prefers to wait for the less expensive paperback versions of books (while I would prefer to read a book that's just been released so that I can compare my thoughts to those of the reviewers when they do their synopses). When I selected a hardback attendance would drop a bit -- I finally connected the dots and asked if that made a difference. I like the idea of rotating the "chairmanship" and really do think it would make for a wider variety of reading material....I try to be unbiased but I'm sure my preferences show through somewhat in my selections. My daughter's new mother-in-law and I found we are both in book clubs -- she's in North Carolina, I'm in Kentucky. Her group sends in suggestions and one person compiles all these and they vote on their 12 selections for the year. Her club has been a wealth of information and ideas for our group. I would highly recommend reaching out to other clubs in other areas to find out books they are reading and how they make their meetings interesting. If you have a good bookstore in your community most will be happy to display the book your club is reading each month to assist other customers in selecting reading material. They will work with you to make sure there are an adequate number of your next month's selection too if you tell them ahead of time. Our community's bookstore hasn't been that cooperative so we have discovered an online site where you can buy books for $9.95. www.zooba.com. A great website and source for buying even very current books at a bargain price. Thank you Jane, you've certainly shared a wealth of ideas here! I wish you and the Bookaholics many happy years of reading.